Chieming is the largest village on the eastern shore of the Chiemsee, with just over 4500 inhabitants. It is named - like the lake and the region - after the legend of an old Bavarian noble Chiemo who is supposed to have lived in this area. It dates however back further than Chiemo, showing traces of Roman and Celtic settlement. 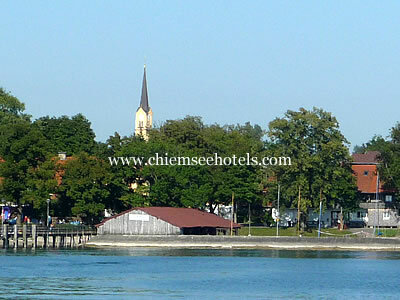 Nowadays it is the second largest resort on the lake after Prien on the opposite western shore. The coat of arms of the villages shows a sword crossed with a key - the sword is a reminder of the Roman military road which passed through here while the key symbolises the former church of St Peter and the fact that Chieming was for hundreds of years part of the diocese of Salzburg. Some of the finds from this rich history are displayed in the Heimathaus in the village centre.